Hungarian Vizsla Forums > Vizsla Problems > Behaviour Problems > Won't eat...have I created a monster? Won't eat...have I created a monster? For the past 6 months I'd make Riggs shake my hand before he could eat his food, which was pretty cute. Then it started to be a shake into him roo'n at me for a few seconds before he'd eat. This progressed into shake, roos, and then waiting for me to give him some sort of command before he would allow himself to eat. You can see where this is going as NOW my problem is that he just flat out wont eat! He's waiting for some command or something in order to allow himself to eat...I don't know the command to set him free. When I leave in the morning I'll put his food in his crate and it'll be untouched by the time I get home. I can get him to eat a few kibbles at a time like treats, but he's down from 4 cups a day to now a touch over 2. He's 1. 5 years old. Other factors: when I'm letting him outside to go the backyard...he first runs to the closet and lays down. When I go to him all I have to do is touch his collar...then he runs to the door like all is good. He also needs me to be outside in order for him to go the bathroom, which is new. All of these behaviors started about 3 weeks ago and they are now out of hand I'm worried about what he'll start doing next. Re: Won't eat...have I created a monster? It sounds like Riggs has a little OCD. No... I'm only kidding! I can really relate, though. My boy Willie waits for a command before he will begin eating. I have no idea what the secret command is. In fact, a while ago I posted about it. I tried all the suggestions I got, but nothing has worked. I got Willie out of the dog pound, and so I thought maybe his first owner taught him to wait for a certain command. That door is locked, though, and I've never found the key. What I do now is put his food down, tell him dinner is ready, walk away and ignore him. Eventually, he goes over to it and starts eating. Good luck with Riggs! hahahah, no doubt some OCD. Thanks for the suggestion; that's what I've resorted to the last two days is to give up with the appraisal combos in attempt to get him to eat. Just drop it and say EAT! Very caveman-ish...so we'll see how it goes. Riley always sits for her food/water and we say "leave-it". She knows she can't touch it until we release her with an "okay!". You should try teaching some release word such as "okay" because then he will know that once you say that word he can go ahead and eat. Sorry I left that out...The handshake was always followed by an excited "YES". This has been his release word since he was 10 weeks old with tricks, general appraisal, and food. It's just not working anymore. I wanted to teach Oquirrh to "leave it" whenever I dropped food on the ground or had food in my hands. I started by pushing his nose off the food in my hand and when he left it I would say "take it". He will now wait for me to say "take it" before he will eat his food. Maybe try going back to basics like this and maybe he will get into the routine of taking the food when you set it down and tell him "take it". Good advice Oquirrh, I'll try working with him tonight. I wonder if Jack is doing the same thing. I posted something a week or so ago about Jack not wanting to eat. When I go to feed him he has to sit and wait. Once the food is down I tell him "OK". Then after awhile I would make him shake or high five. Just recently he wouldnt eat. Reading your post made me start to think. Now to get him to eat I have to crush up a treat and sprinkle it in the food. I dont want to have to do that every time though. I didnt do it Saturday morning and realized at 9am that he still hadnt touched his food bowl. So I started to hand feed him and then he started to eat out of the bowl, but only that time. If you figure something out let me know. I think I'm on the same situation as you. we've got the same problem with our pup. She doesn't like to eat her food. We feed her dry food. We're about to change from the breeder's food ( Eukanuba Puppy Large Breed ) to Orijen. So about few weeks we mix the food. When we handfeed her she eats everything. Out of the bowl she doesn't eat. Put the food on the floor - she will eat. I tried to give her food on different plates and bowls but no way She has the same bowl for water and she always drinks out of it. Today I sprinkled some shredded coconut and she ate.But not that much. Sometimes I sit next to her and keep the bowl in my hand. That makes her eat - but not everytime. It's sooo difficult to feed her. I don't think that its something with the food itself. When we use the kibble as treats she eats whatever she gets. I really don't know what to do. :-\ I don't want her to get used to eat only out of our hand or that she gets used that we always sit and monitor how she's eating. 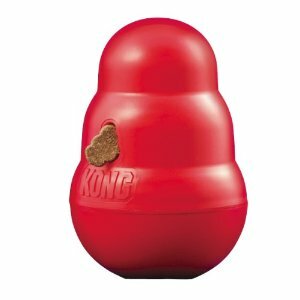 We feed each of our three dogs their night meal from their own Kong Wobbler to make eating more fun and last a little longer... I wonder if your picky eaters might have fun eating with something like this? @Lindsey1420 - Orijen is a great high quality food, but we found that Finch had tons of bad gas on it. We ended up switching to grain-free Taste of the Wild and she does really well on that. Just something to on the lookout for as you transition!